When I began scouting this year’s defensive linemen, I immediately read all I could about the prospects. I saw countless articles on Florida’s Caleb Brantley, Michigan State’s Malik McDowell, and Alabama’s Jonathon Allen. I even saw a good amount of reports on Auburn’s Montravius Adams, but did not see many projections which put Iowa’s Jaleel Johnson into the first two days of the draft. After watching many of this year’s interior defensive linemen, I can firmly say that Jaleel Johnson deserves the fan fare. He is a far better player than many of the other highly touted tackles, such as the aforementioned Adams and Clemson’s Carlos Watkins. And while I have seen many project Johnson will be drafted somewhere between the third and fifth round, I would not hesitate to take him in the first two rounds. Jaleel was an incredibly productive, and disruptive, one-gap player at Iowa. When watching their games, it seemed like Jaleel was constantly in the backfield causing havoc on opposing offenses. He has a ridiculous motor, and refuses to give up or stop on any play. In pass rush, Jaleel used his quickness off the ball as well as his play strength to overpower and win versus offensive guards. Johnson has a good initial burst on almost every play, and has the natural power to beat guards with bull rushes and powerful hands. On this play we see him simply dominate the offensive lineman, winning before and during the snap. His ability to keep his pads clean in pass rush by utilizing his own arms and hands is impressive, and the fact he could simply drive back and discard of another human being with ease is incredible. Once again in a pass rushing situation, we see Jaleel shine. His power right from the get-off is impressive, as he delivers a strong blow to force the guard to reset his feet and hands, before bulling through him for the sack. In an earlier scouting report of Carlos Watkins, the Clemson defensive tackle, I noted how Watkins relied too heavily on his bull rush. And while this bull rush helped him press the pocket, he struggled to shed blockers and turn his pressures into anything substantial on most snaps. Jaleel Johnson doesn’t have that problem. While he doesn’t have a full range of pass rush moves, his bull rush is that much greater than most defensive tackles in this class that he can win with it consistently. He also does a good job of shedding the blocker when in position to make plays. He has really long arms for a defensive tackle, and is able to convert speed to power when rushing the passer. Jaleel Johnson may be the most impressive pass rushing defensive tackle in this draft class. Against the run, however, he does have some issues. Still, he has a good sense of both block and play recognition, and is able to keep his pads clean of potential double teams. Here, he recognizes the center is going up to the second level and works back to the guard to stay clean on the play side. Then he uses his strength and leverage to beat the guard and make the tackle for loss. The basic problem I have with Jaleel’s game can be fixed through getting in the weight room over the next couple of years. By adding strength to both his upper and lower body, Jaleel will be able to better anchor against the run and stalemate double teams at the line of scrimmage. With his technique and football IQ already being what it is, I think Jaleel will be able to improve on the little things to become a better run defender at the next level. Once he does that, look out. Jaleel Johnson has a chance to finish as a top three interior defensive linemen on my draft board. Simply put, the guy is impressive. Jaleel is an incredibly disruptive player who lives in opponent’s backfields. His burst, get-off, play strength, and ability to convert speed to power is downright impressive. While some reputable websites have had Johnson going in the middle-to-late rounds, I can see Johnson going as high as the end of the first round. 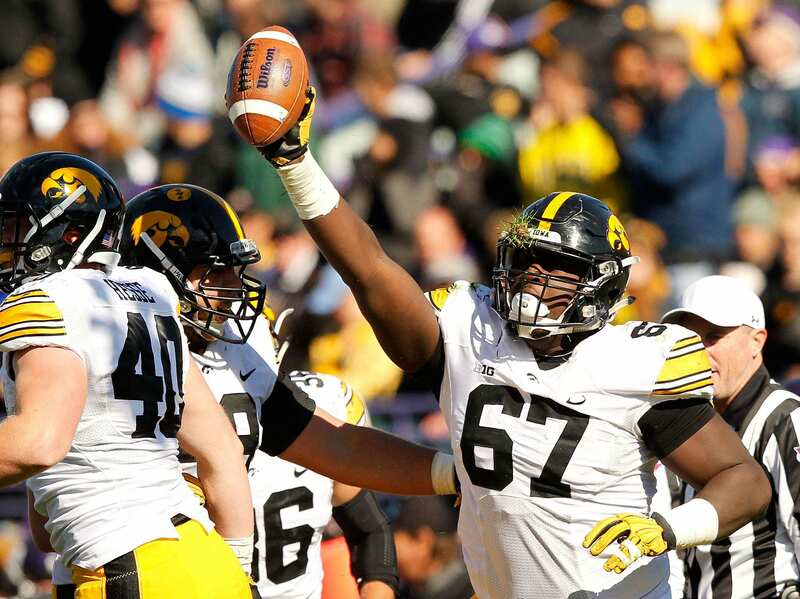 I have a first round grade on Jaleel Johnson, and he’s becoming one of my favorite players in the entire draft.